Welcome to a lazy Sunday in Queens. I have been a complete recluse of late, and as I’m typing this, I’m realizing by “of late” I mean one week. I haven’t gone out in one week. I’m used to going out a lot, and the last week, my bed and a pile of books is just much more appealing to me. Today I decided to break the spell of constantly ordering in by cooking something in my crock pot. It’s a crock pot kind of day. Throw something in there, get a bunch of stuff done around the apartment, then have a beautiful home-cooked meal. I decided upon a “Sweet Chicken Curry.” I put on my winter coat and began the 10 minute walk to the nearest grocery store. A word about my neighborhood. I live in a little-known area of Queens that is the intersection of Asian, Indian, and Latino communities. Everyone in my building is Chinese, and most everything around me is Chinese in one way or another. The markets are small and niche, they have plenty of rice noodles, but no cheese. I need cheese in my life, so I typically walk the 10 minutes to the Latino neighborhood that has a somewhat larger grocery store. It usually has what I need, but it is also niche and doesn’t have major things like fish. So I arrive at the grocery store and find everything on my list, except mango chutney. 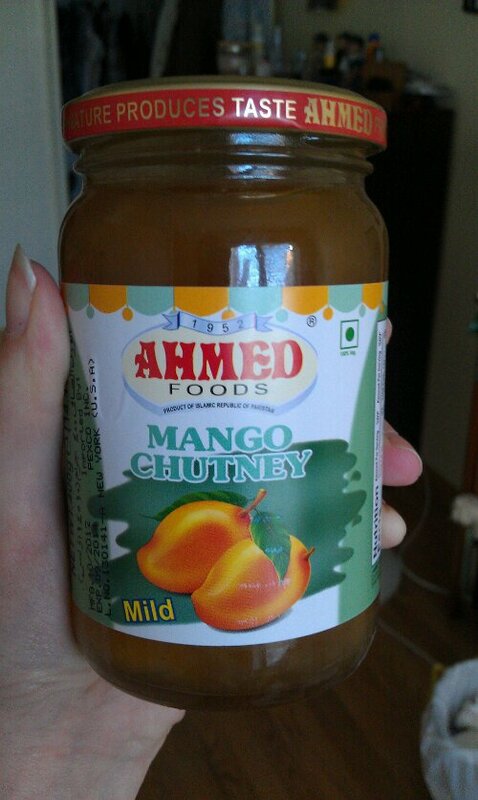 I needed half a cup of mango chutney. I started beating myself up. How could I be so stupid as to pick a recipe with an ingredient so classicly Indian. Of course my Latino grocery store wouldn’t have it. They have bags of rice labeled “Arroz” not “Basmati.” I had left my cell phone at home (because I sometimes need to prove to myself that I’m not a slave to it) and was trying to rack my brain for what I could use to replace it. It’s just a jelly-like thing, right? Could I use jam? Could I use fresh mango and extra curry powder or something? Then I realized how silly I was being. It’s a 15-minute walk from that grocery store to an Indian neighborhood. I can tough it out. So I put some “Exile on Main Street” on my ipod and began the journey. I stopped in every grocery store along the way, just to check and was amazed at what I found. There’s this gigantic Asian supermarket close to me with an amazing fish and meat market, free samples of dumplings, every sauce imaginable. It made me realize how foolish I am to spend so much time on American foods and not taking advantage of what is around the corner from me. I make it to the Indian markets and wander in and out, finding mint chutney, mango puree, pickled mangoes, and even more specialty markets I wish I’d taken advantage of sooner. So I stop into my seventh market of the day, scour the aisles, until I found a promising section with glass jars. There it was, the above jar. I thrust a mittened fist in the air in victory. I was the idiot white girl in line at the all Indian-store and absolutely all smiles. My spicy chicken curry is slowly warming in my crock pot, and I feel so accomplished today. I’ve been reading a lot of books about redemption lately, about people going to far away places or doing crazy things to save themselves. But sometimes even the smallest adventures are equally redemptive. I love this mini-adventure, because it’s so typical living in a city – you get so used to your routines and usual places that it’s easy to overlook all the unexplored possibility in somewhere as close as your own neighborhood. And I also love it because all those ethnic grocery stores, from hole-in-the-walls to supermarkets, can be so inspiring for trying new things in the kitchen, and usually offer much healthier and often cheaper ingredients (once you learn how to use and combine them!) than an American-foods grocery store. Here’s to future home-cooked goodness! So… How did it turn out ? Kinda watery…not so good. Oh well.